Added by Citizen Reporter on February 22, 2019. After a roaring start this year pushing what has been described as a “PC agenda,” the Oxnard Council continued at its 2-19-19 meeting, with attacks on gun shows and oilgas extraction, led by Mayor Pro Tem Ramirez. In each case, the city has no jurisdiction, but attempted to pass feelgood (a term used by Councilman Perello) resolutions in an attempt to exert pressure on county and state officials to bend them to their will. Some council members spanked her for expanding the scope of the oil/gas resolution beyond what they thought was agreement on only stopping new offshore exploration. So the Council voted only to oppose new onshore exploration. There was a large crowd assembled to speak on these controversial items. The Council also voted to accept the annual CAFR (Comprehensive Annual Financial Report) which is a California government equivalent of a profit and loss statement. Woody Thomas- helped explain a complainant’s problem, with a city low-income housing building, with poor service, and no hot water in her apartment. He also emphasized pest problems- with bedbugs (OK now)., but there are other pests. Needs fumigation. Can’t get some basic repairs made. Has helped with some work on his own. Commented on ancient stoves which under-perform. Guadalupe Moreo- Teacher at Pacifica HS- Thanks and appreciate Council working with district re: construction of new HS. There is an opportunity for a $50 million matching grant- needs their help. Existing school badly overcrowded. Manuel Herrera- Thanks for honoring memory of Irene Avila, who had so much to give to the city. Her service was taking place as he spoke- he was leaving for it. Opposes offshore drilling and gun shows. Viola Alvarado- Sophomore at Pacifica HS. Advocates new school for better environment- overcrowded. Long lunch lines crunch her time. Bathroom lines also long. Would improve education, enrich Oxnard. Ariana Ortiz- Same as above. School has 30o0 students vs 2000 capacity. Will help jobs. Pat Brown- Commented on Port of Hueneme is using large area at Ormond Beach to park cars to hold for dealers. Also at Camarillo & Oxnard airports, parks and more. She opposes this. They should use their own property near the Port or haul them elsewhere. This property should be a national park. Area is under-promoted, lightly used, unprepared for wider use. She wants city to purchase and develop the land for recreation. Angel Garcia- Commending City Manager on contracts signed and cyber security firewall. Wants Council to tenaciously work council agendas, be more proactive, ask more questions. Need leadership more than ever. Ashley Golden spoke on the Miranda property, proposed as a school site. The city has met with the developer and school district about traffic flow and a joint use agreement for new school. The City is being asked to mediate the deal. Applicant submitted last Friday for March 19 review. Deadline is April 1 for bond submission. Madrigal- Attended Rio Lindo Neighborhood meeting and Gisler meeting, Rotary Club elementary school basketball tournament. Thanks to Ramon Lopez, La Colonia Neighborhood chair who lost his wife Irene, who was always helping, cheerful. Services 2/10 at St Anthony’s Church at 10 AM. Basua- Took City Mgr on trip to District 5, including Downtown Oxnard and areas of concern. Lunched with Fire Chief Darwin Base and toured facilities. Ramirez- Congrats to Oxnard PD for 3 consecutive years’ reduction in crime. Oxnard is a”safe city.” We tell the truth about it- other cities may not be so straightforward. Thanks for picking up guns from people who should not have them. Need help to support affordable housing. This week big PACC (Performing Arts Center) event- RescueCon (people who rescue animals). Perello- Celebrated the late Larry White, who was also a war hero, land developer and worked for city. Council needs to have substantive items on agenda, such as gun buyback, gun pickups. Sierra Linda Council chair. says they are watching for crime with cameras. Recent area murder rattled them. More trees falling.-dead trees need removal, are very dangerous, potential liability. Lopez- Thanks to Police Chief Scott Whitney re: crossing guards concern. Flynn- He’s a longtime gang injunction advocate. Reviewed injunction revision and intervention program are badly needed. Finance Committee will address $14MM unfunded pension liability problem (long term liabilities are FAR higher). Market returns will not make the needed numbers to fund the program. What cuts will be needed to accommodate these will result in less service. Flynn previously told me he is opposed to tax increases. Says we need $175 MM annually for general fund to meet needs- running about $30MM short annually. Both of the following items are sponsored by Mayor Pro Tem Ramirez: 48 speakers signed up on the oil drilling item alone. RECOMMENDATION: That City Council adopt a resolution opposing new or expansion of existing offshore oil and gas leases off the coast of Ventura County and related onshore development, fracking, and related techniques; and supporting a phase-out of oil and gas extraction and a framework to develop new responsible renewable energy projects. Ramirez says feds want to open our offshore waters to oil exploration. She said it’s a matter of life or death to stop this and that a clean renewable alternative is preferable. Need to reduce carbon footprint if we want children to have a sustainable life. These are obviously very controversial and unproven claims, but most of the state and local govts have taken this stance. Flynn said the resolution would call for the halt of exploration and phaseout of existing extraction. He opposes the latter. City Atty. Fisher said the resolution opposes US Executive Order 13795 of 4/17. Turns out he wasn’t quite correct- or at least complete. Paty Kideros for Senator Hannah Beth Jackson- Supports resolution to oppose offshore and Onshore drilling and fracking. Described those activities as a threat. Margaret Cortesi- Her grandfather was participating in shutdown of horse usage, says gas and oil are now being phased out, too. Jose Barrera- Commended council for being more green, although resolution would lead to shutdown of needed onshore drilling, jobs, tax revenue. Rudy Zamora- Pipefitter, union member working in oil and gas. Jobs are meticulously planned and executed with precision, environmental considerations. Opposes ban letter. Tony Skinner- Exec secy of Tri-County building trades. Industry provides underside of jobs paying over $100K, with predominantly local workers. Opposes resolution. Maria Castro- Reject resolution. Oil and gas employee of CA Oil and Gas. Ex-USN. Has good career, homeowner. Mark Trout- President of Renaissance Petroleum LLC. Country is one of leading oil.gas producers in CA. Trump executive order withdrew Obama order. Opposes resolution. Bill Lind- Eng specialist for CA Resources Corp. Low average wage in the area, Many residents pay 50% of their income on housing. This industry raises it. Opposed to resolution. Ken Bork- CA Resources Corp employee- Environmental Resource Specialist, own home, pay taxes. Keep an eye on the economy. Justin Peters- Ca Resources Corp Safety Officers.safe, high payijng, local jobs. Opposed to resolution and sending money overseas. Anthony Mirellas- Local 585 busies manager and on workforce development group. Opposed to removing jobs from the area. American made oil, American workers, not foreign and terrorist country oil. Otto Tillman- 14 years in oil fields- against ban. Need job. Always work safely. Daniel Adams- work for contractor who works for oil company. Opposed to resolution. A lot more things than you think require petroleum. Want to keep money, jobs, here. Dan Smith- VP IPBW- 21 years in oil/gas. Resolution supports getting rid of opptys. 76% of homes here powered by gas heat. Patagaonia needs oil and gas to make their jackets (to raucous laughter). Jeff Bodie- Represent 500 electrical workers in county. Opposes resolution. Oil and gas industry provides many high paying jobs. Resolution stepping too far into the future- lost balance between oil and green energy. Ann Trout- Employee of Renaissance petroleum (local onshore drilling). Opposes resolution, because it also opposes onshore production. Chris Houston- Electrical workers business rep. opposes resolution. Lack renewable framework- need oil and gas. Oppose resolution. Dean Sutherland= IBW apprentice and local press secretary- have 70+ apprentices now. Much more money in oil and gas here than 15 year life solar panels made of hazardous material. Opposes resolution. 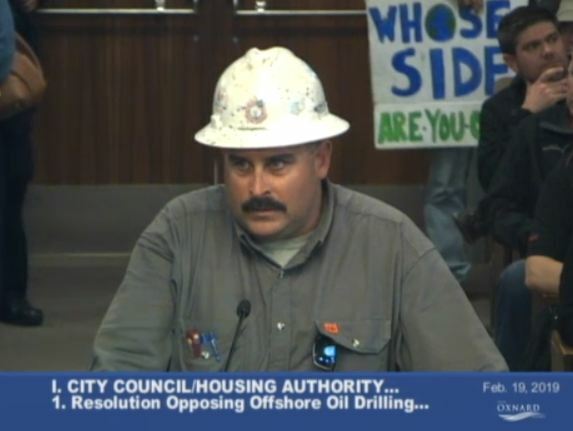 Andy Castillio- Fiekld rep local 585- have members in oil fields. We are local people, not statistics. Ivory tower on this un-American resolution. Martin Rodriguez- President of Tri-County Building trades/iron workers- Misguided and irresponsible resolution. Originators not thinking of community impact. Opposes resolution. Julie Bergie- Western States Petroleum Ind- Opposed to resolution. Sustainable energy cannot be achieved without oil/gas. How can we get oil and gas help pave way fr renewable resources? His industry already puts a lot into renewable resources. Need both. Joshua Madrano- His job depends on oil/gas. Local guy. Opposed. Oil and gas industry people lined up to oppose the resolution at the 2-19-19 Oxnard Citty Council meeting. Christian Carino- Thanks for considering community. Oil/Gas imposes considerable costs. $33 trillion/ year cost. Studied Environmental resource management. Kevin Ward- Thanks supporting resolution to save environment. Major spill 51 years ago created earth day/ 3 years ago Refugio spill defiled/despoiled entire area. Trevor Zierhuts- VCEDA man opposes overreaching resolution which could be extended to onshore operations. $60oMM local business, $180MM labor and $21MM in taxes in area. Consider that. Deborah Baber-Savalla- What happens in Oxnard does not stay in Oxnard. Need revenue. Oppose resolution. Will impact overall economy. Steve Nash- On Clean Power Alliance- we are facing existential threat due to global warming cruised by fossil fuel extraction. Calls on officials to save us from cooking in greenhouse gases. save our planet, etc. Supports resolution. Stacy Miller- Chair of Oxnard Chamber of Commerce- oppose resolution. Serious decline in jobs, averaging $115,000/year. Eco development is supposed to be a major priority. Larry Jansen- Employ 17 people in the industry + 50–100 subcontractors- big potential job loss. Opposes. Andrew Fish- Moved here for beaches. Spills happen. Spill went all the way to LA. Works in solar industry- fast growing sector. We’ll find some high paying jobs for you. Supports resolution. Kristin Hesop= Marine Cons. Director, Environmental Defense Center- favors resolution. I oppose Trump admin. oil drilling plan. Claims 70% of Californians oppose. Climate change danger, oil spills 1969, 2015. Oil should be thing of past. Thomas Morales Lechi- 2015 spill killed hundreds of animal s polluted beaches,saw wildlife washing up, caused by onshore infrastructure. Had 2016 arrow oil field spill 16,000 gallons. Onshore production caused pollution, only dirty oil is left here- tar sands. Claims 2 local companies have bad records. All govt scientists recognize danger of climate change- only have 12 years left to stop it. Supports resolution. Patty Einstein- Think forward to protect our coast. thanks for foresight. Supports resolution. Chris Buelling- You will cause more issues with this resolution. No oil pumping, means more seepage. Phase out will hurt a lot of jobs. Opposes. Pat Brown- Want to live to see all oil and gas jobs gone and replaced by solar. Supports resolution. Karen Wafford= Want to protect water and coast for children. Oil has been supported by taxpayers via subsidies, need to go to renewables. Supports resolution. Troy Corley- Support resolution. Small sector of jobs may be lost in far future. (misquoted resolution). No jobs if coast goes to pot. Mike Garcia- (? )_ Forbes (Magazine?) said BP oil spill cost 10 billion. SB spill penalties were $35mm.- govt./taxpayers paid for it. (incorrect). Mike DiMartino- Holding bag with abandoned power plants supplied buy oil and gas industry. They leave pollution . Unions should think about finding other jobs. Supports resolution. Arturo Giro- Do not want to take away jobs, but dire climate- cold weather caused by Global Warming. Shutting down oil/gas actually creates new jobs. Supports resolution. Helen Conley- Supports resolution. Board member of environmental org. Congratulated oil workers on brilliant organization of tonight’s presentation (resolution opponents were overwhelming majority). Prop 65 warns about cancer/reproductive toxicity all come from oil/gas production (untrue). Mayor Flynn- 4 aspects to resolution- offshore, onshore, new energy projects and phaseout of oil/gas extraction (he is opposed to that part). Lopez- Support resolution and addressing labor concerns and preserving coastal resources. Find a middle ground. Perello- Believes in climate change, green energy. Restitution has gone way too far (“phaseout of oil and gas extraction’). Yes, there are some irresponsible companies that give industry a black eye. But all industries have accidents (Tesla crashes). Eventually we will go away from petroleum. He has friends/donors on both sides of the aisle. May be attempts to water it down. It is a grandstand attempt to do something. 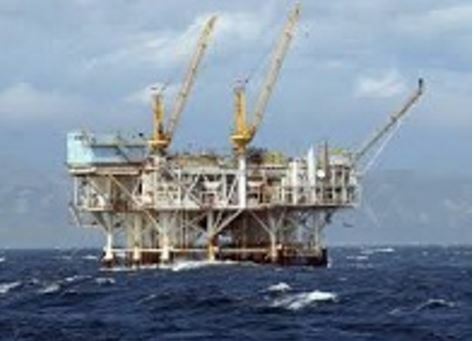 MacDonald- Ramirez had sold an offshore exploration ban. This is not what the resolution said- bait and switch. NOT what was originally asked for. Renewables have their own problems. Gave NRG solar plant as a horrible example. Much work to go to reliable renewables. There is a cost involved. Voted for 100% clean power option. This proposal will not protect our coast forever. In his youth, went to beaches at Santa Barbara all the time, there was tar on his feet even before the spill- seepage. Fuel will need to come from somewhere else if we stop it here. Support HR 279 and 310 to protect CA coast. Can’t support resolution. Ramirez- Really believe we are at a crisis point with climate change. We’ve been warned, alarm going off, our children’s lives endangered due to climate change. We’ve been told we only have 12 years before warming makes many changes uninhabitable (see video at about 2:23). She serves on Clean Power Alliance board-just going into effect- all contracts have project labor agreements. Future is renewable energy, not fossil fuel, which has already damaged us. Exxon Mobil lying about the consequences. Supports resolution. Basua- Thanks to Ramirez for bringing this to us. Support renewable energy, but uncomfortable with parts of the resolution. Not a believer in telling people you’re gonna lose your jobs. Can we change resolution to agree with what we thought we were going to address today? Madrigal- will go with majority of my colleagues. In favor of taking care of coast, not phasing out production. Cannot support (that part). Flynn- largest meeting turnout in years (Aaron Starr utility rate rollback was last biggest). He is opposed to phaseout of oil and gas extraction. If we eliminated item 3, Council should approve. Focus should be on blocking new offshore drilling. Shell Oil brought my family here. favors item 1 & 4, So moved, seconded by MacDonald. Perello- must check wording first. Vote, for 1& 4 only, was 6-1, with only Perello dissenting. RECOMMENDATION: That City Council approve and authorize the Mayor to sign a letter requesting the Ventura County Fairgrounds Board of Directors cease contracting for new gun shows at the Fairgrounds and pursue any legal or legislative remedies as may be necessary for this cessation; and transmit such letter and communicate the Council position to the Board of Director and State and regional officials. Background: The Venture County Fairgrounds has hosted orderly, responsible gun shows for many years. Anti-Second Amendment organizations have been seeking to stop the shows, claiming that they help proliferate firearms and actually help create a “gun culture,” glorifying guns and violence. The omission which controls the Fairgrounds is not under the jurisdiction of Ventura County or cities, so organizations and municipalities are trying to pressure them to drop the shows. Second Amendment advocates claim that such campaigns are multiple attempts to incrementally erase the Second Amendment (2A). Some anti-2A advocates actually claim that it confirms no right of private gun ownership, although Founders’ words, court rulings and actual practices say otherwise. The Council previously voted to put this on the agenda- now here it is. Ramirez campaign is based on erasing Oxnard’s persevered “gun culture.” She particularly objected to gun show ads around town, including that one allegedly appeare at a bus stop near a school, featuring a bulls eye. Only MacDonald seemed opposed. But Flynn also voted against it, expressing some reservations about it, saying he won’t make up his mind until he goes to his first ever gun show in May. Perello and Basua expressed some concerns, but voted for it anyway. Margaret Cortese- Smoking was cool when she was growing up- now it’s guns, especially for men. Smoking no longer cool. Guns are just as lethal as guns. Want forbid guns just like we now forbid smoking. Discourage. Deborah Baber Savalla- Something I never hear: how many gun crimes are committed by legal Citizens? Why consider a resolution which will deny rights? Oppose resolution. Pat Brown= Rarely go to a party where people are smoking. We don’t need guns,. Have police with all the guns we would ever want to protect us at any moment in town. Can get a police officer within a couple of minutes. People who aren’t supposed to have guns seem to get them and be caught by police inter cars with guns, knives, marijuana. Troy Corley- I started the ball rolling on stopping gun shows. It’s about gun shows, promoting guns, ammo. 393 million guns in this country. Las Padres National forest just banned guns, target shooting. Guns are not fun, guns kill. Clair- Oxnard Democrats- party opposes gun shows. Julie Martinez-State prohibited magazines of more than 10 rounds. Borderline shooter would not have been able to utilize his magazine if law was enforced. Demonstrate bravery by supporting resolution. Stop rapid fire guns. Veronica V- Oppose gun shows. hunting shows, which I call gun parties. The idea that only bad guys shoot people is ludicrous. We are limited in what we can do about gun control, but can change gun culture. Also upset about knives and pepper spray. Madrigal- Shouldn’t have gun shows but not forbid gun ownership. This is just a show of support. Re: speakers talking about smoking- unfortunately it’s cool again. Basua- Supports resolution- in hopes they will ban gun shows. Understand people kill, not guns, but still support. Ramirez- A friend saw gun show ad at bus stop. That’s when I thought we shouldn’t have that advertising, it horrifies people. State making money off gun culture via gun shows, This is hurting us. Many times, guns are used by young people for suicide (there are more gun suicides than murders, almost all with pistols). Rise in gun killings not just mass shootings, but suicides. (gun deaths are actually down about 50% since 1992). MacDonald- Been around firearms whole adult life. I’m bothered by statement that gun culture kills, largest mass killing was OK City bombing- killed 168 people (that was before 911, which used airplanes). In Europe, weapon of choice is running down people with motor vehicles. We are addressing symptoms, not causes. “I can’t protect my home, because I’m prohibited from owning a gun, while criminals have them.” Average firearms arrest only gets 6 month sentence- not a sufficiently serious deterrent. 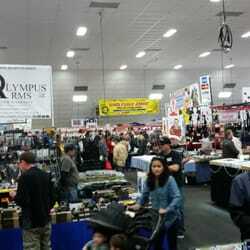 Fearful of eliminating gun sales/shows which are legitimately selling. Some people shouldn’t have guns. Appreciate Ramirez rationale, don’t agree. Perello- some of these resolutions are like “feelgood.” If someone wants to hurt somebody, they can hurt someone. Look at kids with (violent) video games. Likes mandatory militarily service, firearms training. How many people pulled over who bought at the fair- irrelevant. People feel insecure. Do we take on soft drinks, fast foods- a bigger threat. I will support, but it is like blowing in the wind. Lopez- Supports. Addresses a national issue. It is a County facility, but has an overflow effect on our city. Don’t need to have more guns than necessary. Flynn- Never been to a gun show. Going to May 4-5 show. He remembers someone was killed right near a gun show ad. The ads don’t responsibly promote the events,. He won’t act until he goes to a gun show. He spoke to gun show promoter about more responsible ads and he seemed to appreciate the idea but did not commit to anything. Won’t make overall comment about mental health crisis. Do not support, but have tremendous respect for courage of Ramirez. Vote 5-2- – Flynn, MacDonald dissented- Others yes. These items are normally voted on as a group and approved, unless items are specifically pulled for discussion by a Council member. See them on the agenda item L.
Perello pulled Vineyard Ave paving (see L-4 below), tech support and engineering- are there specific fee schedules. Residents not informed of possible March start. All tro be paid for by grants. Arterial roads are paid for via state and federal funding. Item L-4- SUBJECT: Award Contract A-8118 to Toro Enterprises for Vineyard Avenue Street Resurfacing Project. RECOMMENDATION: That City Council adopt a resolution upholding the Planning Commission’s approval of Planning and Zoning Permit No. 16-540-03 (Special Use Permit for a Planned Development Permit), subject to certain findings and conditions set forth in Planning Commission Resolution No. 2018-38. Appellant complained that proposed new development at 2441 N. Vineyard Ave. would block public view of his business. City Atty Fischer said that there is no real case. Ms. Mallory of Development Dept said 77 ft setback is not required and that building and signage are compliant. Said that all legal requirements for notification were adhered to. Appellant counsel Mark Fellers pointed out that proposed development would make his business invisible to street traffic.He feels building is too tall and will block business identification to passers-by and harm his business. He showed a prior project on the site with a 77′ setback and only a 25′ high single story. Would affect client’s business and city sales tax revenue. Also, tree could be trimmed back. Wants uniform setback along Vineyard, which would also improve aesthetics. Wants 77′ setback and 25′ maximum height. Mallory says that there’s a lot of planning work involved- she didn’t even speculate on what the developer would have to do. Perello would like to see some kind of accommodation. Why 10′ now and 77′ before? Alex King, project architect: sayus it does not block the view of the building and says he has renderings to illustrate that. Says tree is what’s blocking view. Setback is actually 46 feet. He did other local buildings, such as Food for Less and other local projects. Alex Shotan- partner in Shoe City project. received overwhelming approval, Project has 46 ‘ setback. the 77’ setback was by choice, not requirement. Area setbacks vary. Their shopping center will bring more jobs./revenue to city. Medical office and bike shop are more of a”destination” than walk-in business. Appellant Counsel- – those are just present tenants. Another speaker- Not a good building-ugly. Big setback is a suburban oriented, car-friendly design. We are not getting good buildings in Oxnard. Strip wall glass wall design is not good architecture. Flynn- must base it on what the appeal is based upon. Mallory- Multi-use path will be built. re: architectural review- Commission very happy with it, included 3rd party architectural review required for scenic highway projects. City Atty Fischer- appeals should primarily, but not exclusively, consider appeal issues. Perello- Asked City Mgr. Nguyen for recommendations. Nguyen- uphold Planning commission rulings, follows all rules, fully by the book, fully vetted. Sees no grounds to reconsider. Need some level of certainty. Having a hard time seeing merits of appeal. Tree is a major view impediment. Architecture doesn’t wow him, but it doesn’t trouble him. MacDonald- no reason to overturn planning commission. Ramirez- Appellant is former city atty of Thousand Oaks. Not a very attractive street as it is. Opposes appeal. Basua- Opposes appeal. Agrees with City Mgr. Flynn- Planning Commission wasn’t divided on this. Supports their decision. Vote- 7-0 to uphold planning commission, deny appeal. F1. SUBJECT: Presentation of a Commendation to Alicia P. Llinnas for 40 Years of Service to Local Broadcasting. After 40 years, no English tonight in the main acceptance speech and no translation of her lengthy remarks in Spanish. Big applause from the crowd, followed by a very brief English summary from her. F2. SUBJECT: Presentation of the Annual Community Relations Commission Community Recognition Awards. The stated goal of the group is to address problems with discrimination and improving community relations. Jose Arellas won an award for businesses excellence, helping youth, donating and working with Oxnard Police DRAGG group. Martha Garcia won an award for outstanding 2018 Bonaventure HS senior- many years working in family resource center at Chavez school in Colonia. Said we don’t need walls and that she represents the migrant community. Outstanding youth recipient was Christopher Ermin, 17 y.o. student working working in community organizations and a theater group. Bertha Garcia won an award for VC Community development org. head to help achieve the dream of home ownership. Finally, the service based organization award went t Esther Poran (?) of the MICOP- a social justice for Mixtecos organization, with another speech in Spanish. A brief English summary was that it is time to organize “indigenous” (actually migrant) community, with ts own politics, ideologies, culture. Who once said, let’s not let any crisis go to waste! needs to take a good hard look at the RIGHTS you say WE don’t need anymore. KEEP YOUR EYES ON YOUR OWN HOMEWORK, so to speak and Do Not Tread On Others! your time in more education for yourselves. This town truly needs leaders that are interested and loyal to the people instead of trying to impress themselves with items that are not in Oxnard’s jurisdictions. and lying about the numbers? I am always amused at people against oil and gas drilling. I guess they don’t heat their homes and they walked to the meeting to express their concerns about drilling for oil and gas. Or is it okay as long as it is Saudi Arabia that is drilling for oil and gas and we spend millions buying from them? For the lady who wants a renewable, low pollution alternative to driving your car, there is one. It’s called a bicycle. Most trips around town take as long in a car as they do on a bicycle. Frees up lots of parking and is good for your health in addition to significantly less wear and tear on road, no pollution and very low cost. Some have called it the most energy efficient machine ever devised.